Matt Kemp was limited to 73 games last season because of injuries. Matt Kemp is aiming to return from his off-season ankle and shoulder operations in the Dodgers’ season-opening series in Australia. 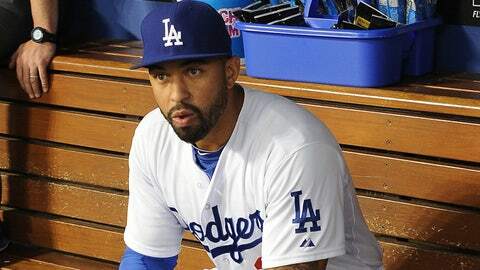 But Kemp’s agent is advising him against pushing himself to play in the two-game set against the Arizona Diamondbacks. Dave Stewart emphasized that Kemp has not suffered a setback in his rehabilitation and said he was telling Kemp to consider postponing his season debut only a precaution. "His biggest issue with injuries has been trying to get back too soon," Dave Stewart said. "I’m urging him to make sure he’s totally healthy." Asked how receptive Kemp has been to his advice, Stewart laughed and said, "Not very." Stewart continued, "He’s really, really biting at the bit." Kemp was limited to 73 games last season because of injuries. The Dodgers will open their season in Sydney, Australia, with a two-game series against the Arizona Diamondbacks on March 22-23. The Dodgers’ next regular season game will be on March 30 in San Diego. With three other high-level outfielders on their roster in Yasiel Puig, Andre Ethier and Carl Crawford, the Dodgers should have the necessary depth to withstand Kemp’s absence. Kemp was cleared to start running on an anti-gravity treadmill about a week ago. Kemp’s left shoulder has presented no problems and the outfielder has been lifting weights regularly, something he couldn’t do last winter when he was recovering from a more serious operation on the same shoulder. "I’d like to take the same approach the Dodgers are taking: Be sure of yourself, don’t push yourself," Stewart said. "I think the team and I are on the same page." Getting Kemp on the same page could be a "difficult task," Stewart said. "It’s not going to be easy," Stewart said. "How we get that done, I have no idea." Stewart also represents Chad Billingsley, who is recovering from reconstructive elbow surgery. "He’s feeling great," Stewart said. Billingsley has been throwing off a mound at around 75 mph. –Hanley Ramirez is in his normal off-season hitting program and working out without any restrictions. Ramirez finished the season with a fractured rib and a nerve problem in his back. He underwent a back-strengthening program this winter to address the nerve issue. –Alexander Guerrero is already working out at the Dodgers’ spring training complex in Arizona. Former major leaguer and Dodgers executive Jose Vizcaino is guiding Guerrero’s transition to second base. Guerrero was a shortstop in his native Cuba. 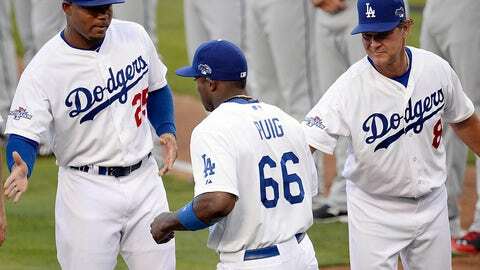 –Hyun-Jin Ryu returned to Los Angeles in noticeably better shape than he was last year, Dodgers President Stan Kasten said last week. Ryu finished far behind his teammates in a running drill in the first day of camp last year.